Thursday night Rick Perry went "On the Record" with Greta Van Susteren to address his Michigan Debate stumble and let the American people know that he is still very much in this race. GRETA VAN SUSTEREN: Governor, nice to see you, sir. RICK PERRY: Hey, Greta. How are you? It's good to be with you. VAN SUSTEREN: Good. Well, I can tease you about last night, except for one thing. I've seen you answer it a million times today. Plus, I frankly -- I've had the same problem myself, so I live in a little bit of a glass house. So I'm sympathetic a little bit. PERRY: You know, it happens. I stepped in it. I tell people, I said, Listen, I readily admit that I stepped right in the middle of it. Matter of fact, stayed in it for a while. And -- but there are a lot of people out there that -- I think, just like me. They think about an agency of government or maybe multiple agencies of government that they'd like to forget about, as well. So that was kind of what was going through my mind after my -- my tongue finally engaged my mind. So -- but as a matter of fact, we're having a little bit of fun with it today. And you can go to my Web site, RickPerry.org, and can give us some ideas or tell us which agency of government you'd like to forget about. Matter of fact, we've already had over 2,000 hits on that site. So you know, the seriousness of it, though, is that the debate last night had some really good things that were talked about. I had the opportunity to lay out my tax plan and my -- how to balance the budget by 2020, how to get this country growing again, so to speak, put a sign in the middle of America that says, America open for business again, and how we take that 20 percent flat tax and mortgage deduction, charitable deductions, the local taxes, get rid of cap gains, get rid of dividend taxes and take 20 percent of that and put it -- matter of fact, put it on a card this size right here. And I'm betting even Tim Geithner can get his taxes in on time if we get this 20 percent flat tax put into place. So that's what Americans want to hear about. VAN SUSTEREN: I know, but you say you've bought some ideas for your website. Here's one that I might suggest to you, is that you tease the media how much more time we play -- replaying that sound bite than we do some of the substantive things last night. I fear what the results would be. But I do have one last question on this, and then I'm going to move on. I'm curious, what did you your wife say to you first? VAN SUSTEREN: Yes, after -- I'm curious. VAN SUSTEREN: She didn't tease you? She didn't tease you? PERRY: No, she didn't. She just said -- she said, Look, I love you. She knew better than to tease me after that, I think! VAN SUSTEREN: All right. Anyway, OK, now, moving right along, I want to ask about some other things. Let's talk first of all what's going on in the economy. Big news in the last couple days is what's going on in Italy and the fact that it has an effect -- it has an effect all over the world. And we have felt this weird thing in the past couple days here in our economy, our market. Now, if you were president, is there anything you would be doing right now about the economic situation in the euro zone? PERRY: Well, the thing that you could be doing about the entire world economy, just -- not just the euro zone, is putting tax policy into place, pulling back regulations that are killing jobs in America. The entire world economy -- as a matter of fact, the safety of the world depends upon America having a strong economy. We need to be opening up our lands and our waters for exploration of energy. We're sitting on 300 years worth of energy resources in this country, and we got an administration that is blocking the use of it. You got the Boeing story going on out there, where the NLRB is stopping a great, venerable old American company from opening up and putting people in South Carolina to work. 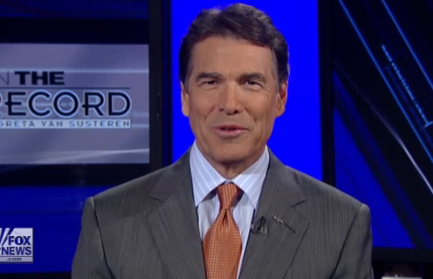 VAN SUSTEREN: But those are -- those are... PERRY: ... for 2012. VAN SUSTEREN: Those are big-picture things that you would do. And I realize, you know, your commitment to those. But I'm thinking more at the moment. I mean, is there anything right now in the moment that you would be doing? Because there are some people who are pretty nervous right now and they don't have sort of that long-term vision that, OK, we'll change the taxes and this'll happen, or we'll change the energy policy. I mean, a lot of people are worried right now and they're seeing the stock market through pretty strange gyrations. Their pensions are locked up into it. They're seeing their money going down. They don't have jobs right now. They're not looking sort of big picture. So I'm curious, you know, would you be making phone calls, talking to people, you know, pushing something? What would you be doing? PERRY: The message needs to be very clear that those companies that are too big to fail are too big. Countries that are -- put bad public policy into place and run up this big sovereign debt, it is not America's responsibility to bail them out. We need a president that is sitting down, getting Americans to work, getting this economy going. And I'll keep going back to that because that is the single most important thing that the president of the United States does, is create a climate where job creators know that they're going to be able to risk their capital and have a chance to have a return on the investment. And it's never too late to start that. I don't know whether this president believes in that or not. But the bottom line is, America does not need to be worried with bailing out a European country that has made irresponsible expenditures, and then all of a sudden, throws their hands up and say, Oh, please come save us. That is not our responsibility in the United States of America. VAN SUSTEREN: All right. We're obviously a government with, you know, more than one branch of government. The executive does need the help of the legislative branch for much. And I was rereading your book today, and in one part, you said the Washington Republicans are unwilling to truly fight. And I thought, Well, if it's a President Perry and he comes to Washington and he's already insulted the Republicans on Capitol Hill, he's got a little bit of a problem on his hands. Do you still think that? What's your thought on the Republicans on Capitol Hill now? And how would you at least corral them and persuade Democrats to work with you? PERRY: ... I'll work with those men and women. VAN SUSTEREN: I was going to say, are you saying do those, Congress be damned? I mean, like, you know, the things that you want to do -- I mean, there is -- I mean, look, there's no secret there's a logjam in this city. It's been a very painful one. It's been going on for decades. But if you come to Washington and you've already -- I'm not -- maybe it's a good idea to call people to the carpet right away. Maybe that's effective. But nonetheless, that is a problem that any president has to do. You can either be -- you know, we need leadership, not a bull in a china shop necessarily, but we need someone who's strong. And I'm just curious how you'd accomplish that. PERRY: Well, I've been a strong governor in Texas and I don't make any apologies to folks. They know what I believe in and they know that that's work for the state of Texas. And my instinct is that the American people, when they elect their president, they're also going to be electing members of Congress and new members to the United States Senate. I think there's a wave election coming in 2012. And I think that the American people are looking for men and women who are going to Congress and the next president of the United States that gets things done. And they're interested in the economic side. How are you going to get this economy going? How are you going to put a sign up in the middle of America that says, America, open for business again? And that's the reason that tax plan, the 20 percent flat tax -- as a matter of fact, I got it right here. It'll fit on that card. And 20 percent with mortgage deduction, with charitable deductions, with local taxes, get rid of the dividends and the capital gains tax, take 20 percent of it and mail it in. My instinct is even Tim Geithner can get his taxes in on time with this. VAN SUSTEREN: All right, in your book, also, you write about -- in terms of the economy, there have been three -- at least for the Republican Party -- three big chances for the Republican Party in recent history. One is President Reagan's election. The second is "Contract with America." And the third is the election 2000 when a Republican, President Bush, came into office. Those are three significant events. But then you're sort of critical of President Bush on the whole sort of conservative -- "compassionate conservatism," suggesting that it's -- it's much -- it was much like a liberal policy and that he didn't make the tough decisions, recognizing, of course, he had 9/11, which is an intervening cause. But I'm curious, what makes you so different that you would accomplish so much more than those three events? PERRY: Well, obviously, the economy is very different in the world that we're living in now. And I think Americans are looking for executive leadership that actually has some experience of creating jobs. And there's not anybody standing on the stage on the Republican side that can match my job creation record. While America was losing 2.5 million jobs, we were creating over a million jobs in the state of Texas. We understand that you have to create an environment where that those men and women who are entrepreneurs can risk their capital and have an opportunity to get a return on their investment. That's how jobs are created. And that's what Americans are looking for, is that type of vision. And we've laid that out with our tax plan on the spending side, on the budget side and on the tax side. VAN SUSTEREN: Do you also take into account, though, the fact that -- I understand the tax structure in Texas, how different it is, but you take into the account that Texas is rich in a particular natural resource that we all want, which made it a little bit of a better environment to try to build jobs from than, for instance, another state which is not so rich, doesn't have a lot of oil, doesn't have the resources of Texas? PERRY: You know, it's interesting, since 1984, the percent of our gross state product went from a little over 14 percent in the oil and gas industry down to below 7 percent. We diversified our economy, and we did it because we put tax structure into place. We did it because we passed tort reform that made a huge difference in the environment in our state from the standpoint of frivolous lawsuits. VAN SUSTEREN: Let me ask you about that. I mean, if Caterpillar wants to move there and YouTube, everyone wants to move there (INAUDIBLE) you become president, you're president of all the states. I mean -- I mean, they're not going to want to move to all 50 states. I mean, so, you know, how do we accomplish that? How -- I mean, how does that sort of -- how do you do an economic policy so that -- you know, we have a limited amount of business, apparently, right now? PERRY: Well, and the great things that need to happen is that a president recognizes that the 50 states are the ones that are out there that should be competing against each other. We don't need one-size-fits- all policy with education. We don't need one-size-fits-all policy on environmental regulations, for instance. Those ought to be done by the states and allow them to make the right decisions. Health care's another great example. "Obamacare" in that one-size- fits-all -- it may not work in Rhode Island the way that it would work in Oklahoma or New Mexico. So let those states compete against each other, and then people will vote with their feet. And those states that'll lose those men and women, those voters, those taxpayers, they'll pay a price. And then the people -- the citizens of those states will make the decisions to get rid of those folk that have kept their taxes high, that kept the regulations unwieldy. And that's how we need to get America back to where we've got 50 laboratories of innovation competing against each other, and the federal government do a few things, like defend our border, but do those things very well. VAN SUSTEREN: All right, you bring up the border. You and I -- I've been in a helicopter with you, looking at the Texas/Mexico border and taking a view of what's being done there. I'm sort of curious -- you know, I'm a little bit uncertain only because I didn't study as hard as I should have, I guess -- your idea of education and illegal immigrants and your idea of what should be done with the border that's not being done because both seem to at least have some sort of -- in some ways, they're going to be competing for the same money, the same problem. PERRY: Yes. You know, I said something at the Orlando debate that was arrogant. May have been because I thought I knew it all because I'd been the governor. As a matter of fact, my wife said, What you said was insulting. And I want to tell the people of America that, you know, I do respect their opinions on this issue of illegal immigrants and the college tuition. And one thing I will promise the American people and -- is that within 12 months, within 12 months of my inaugural, that border will be secure and it will be shut down because we'll put the strategic fencing in place. We'll put the boots on the ground. We'll put the aviation assets in place. And that border will be shut down and secure within 12 months. VAN SUSTEREN: You know, you raised the question, the statement you made in Orlando -- I mean, I'm not suggesting, Governor, that I in any way know the answer to this. I only know sort of, you know -- I'm lucky. I get to ask the questions and the sort of the complexity -- you know, education is so profoundly important. And we want to give a lot of opportunity to everybody. It's really sort of a question is, like, how do we juggle those resources we have? And you know, how do we accomplish those sort of common goals? And you know, for some reason, I mean, I -- I've been there. I've seen how complex it is. I just don't -- you know, I'm so just curious, though, what you would do differently than somebody else on education for illegal immigrants. PERRY: Well, and that's the reason I said that I was sorry for saying the comment that I made, that it was -- I think it was perceived as arrogant. My wife certainly perceived it was arrogant and she said it was insulting. And I want the people who disagreed with me on that day to know that I'm sorry. But the issue is this. These previous administrations -- and this goes back for some time -- have not secured the border. My commitment to the American people is to secure that border within 12 months with the resources that we have, shut that border down and secure it. VAN SUSTEREN: Would you -- if you were head the Justice Department as president of the United States, would you shut down the lawsuit the Justice Department has now with the state of Arizona, or do you agree the state of Arizona's law is one that should not be enforced as unconstitutional and discriminates against people? PERRY: Texas has joined as an amicus with them in that brief. So I support states' rights. You know, the sad part about it is that we're having to come with immigration policy because of the failure of the federal government to secure our border. That's the real issue here. And to have a conversation about any of these issues until that border is secure is nothing more than an intellectual discussion. I'm not going to engage in those. I'm going to stay focused on the most important things the president of the United States is going to do, dealing with that border, is to secure it. I know how to do it. I've been dealing with this for 10 years. And you put the strategic fencing in place and the boots on the ground and the aviation assets in the air, and to the numbers that -- you can shut that border down and secure it. VAN SUSTEREN: Do you do it simultaneously with developing some sort of immigration policy, whatever that may be, for the people who are here illegally in the United States, or do you this in one step, first secure the border, then we'll figure out what to do with that, or do you do it simultaneously? PERRY: You do the border first. If you do not first secure the border, you're wasting your time. And that is my commitment to the American people. Within 12 months, that border will be shut down, the illegal activities will be stopped, and that border will be secure. VAN SUSTEREN: ... we'll be watching, watching the race. It's an exciting race. Thank you, sir. PERRY: Look forward to seeing you. So long. Rick Perry on the Rebound. Governor Rick Perry strangled the 7th Amendment to a point where it died an unceremonious death, by signing the 2003 Tort Reform Act. He was the mastermind behind the death of the 7th Amendment. The Texas Medical Board are his conspirators, since he appointed about half of them, and there is no accountability in Texas for the death of a loved in the hands of reckless, negligent doctors. Leigh Hopper, spokes woman for the Texas Medical Board, has written letters to loved ones who asked the TMB for answers and accountability for loved ones who died as collateral damage in the hands of negligent, reckless homicidal doctors and she responded, " the doctors demeanor tells us if he or she is guilty." Her answer to the families who wanted answers are about as inane as Governor Rick Perry appointing a geologist as a member of the TMB. A geologist! He could have appointed an animal control specialist for all the sense it makes. There is no accountability in Texas under the law for the death of a loved one in the hands of a docotr. Maybe Texans need to resort to their own brand of justice. Just a thought.